You'll be £14.99 closer to your next £10.00 credit when you purchase The Luftwaffe Battle of Britain Fighter Pilots' Kitbag. What's this? Order within the next 3 hours, 54 minutes to get your order processed the next working day! Masterpiece with essential documentation for our library. A short part deals with clothing services, patents and the work ends with watches, calculators, navigation maps and documents nominative, a very good idea! The vintage photos are very good quality, which is not unfortunately always the case of color shots. 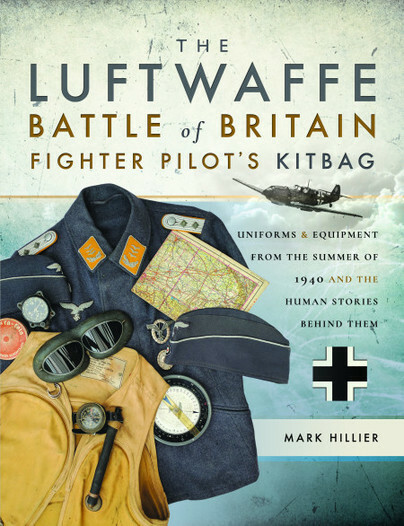 Having seen many books about uniforms and equipment I can say few are in the same league as The Luftwaffe Battle of Britain Fighter Pilot´s Kitbag by Mark Hillier... This is a very useful guide for museum staff, private collectors, the film industry, reenactors and model figure enthusiasts. This book is like getting a little museum in your home!... A truly interesting and very complete and exhaustive reference book, interesting for historians, modelers and yes, pilots alike. Whether you build miniatures or just enjoy immersing yourself in martial history, this aficionado’s reference volume will add a new layer of value to your collection. A book that I recommend for the amount of information and photographs it contains. A fascinating, informative and highly enjoyable read. I would highly recommend this to anyone interested in the Luftwaffe in WWII. There are fantastic pictures in it... the niche market it's aimed for will love it. Add some memories from a few of the veterans who used all this gear we have a well detailed coverage of the German fighter pilot's personal equipment from the early period of the war. There are illustrations from Luftwaffe manuals showing how kit should be laid out in a wardrobe for inspection. The item that I had not expected or seen before, was a uniform carry bag. The information and the colour pictures of surviving items are ideal for militaria collectors, re-enactors and modellers alike. As a modeller myself, this offers a fine reference, interesting for the historian in me as well.